3. King James--Shortly after Henry the 8 came king James. You have probably read the Bible translation that bears his name--and good for you--because the king James Bible is generally speaking, one of the most accurate Bible translations. But, who was king James? He, like the other protestant monarchs of his day, believed firmly that he was in his position by God's will, and in fact all his decisions came from God (something called the "divine right of kings"). King James "ruled" with "authority" " over" his "subjects" who had to "submit" to his "God-given "authority". When the translators were doing their job for king James, they tried, everywhere they possibly could, to insert these words--and the concept that the common people ought to "submit to the rule" of the king. Wanting Luke 4:18........x457.....I believe that most Christians today are very very close to what God wants. We all want to see people get saved. We want to see people get healed--and be delivered from the snare of the devil. We all want to see the poor fed and clothed. Most of us realize that God inside of us desires these things--and most of us live for the times when God works through us to reach out to the lost and the sick and the needy. But perhaps we are missing one final step in the ministry of Christ and the fullness of what God wants. Do we really desire to see others freely released to serve God and minister? Do we really want to see the whole church in ministry? Do were really want the apostolic method--the picture painted for us in the book of Acts? Where's The Gospel?.....Where's The Apostleship?............Something is very missing from the format of Christian chruch meeting---the Gospel! In the Bible the church fucntioned in apostleship, meeting together frequently, in small groups, and going out and witnessing the Gospel. This study looks at the history of the church. Did you know that someone, who lived 1700 years ago decided to get rid of the Gospel function in the Christian meeting? Roman Emperor Says........x494.........1700 years ago, a Roman emperor--who considered himself to be the head of the church--made it illegal to be anything but a Christian. He literally declared everyone in the world (at least the then know world which Rome ruled) to be a Christian--and made it illegal not to be in church on Sundays. This changed the operational plan of the church. There was no more need to operate in the apostolic method--reaching out to he lost and needy. Rather, the church was held under the authority of the tithe-collecting priest--and babies were baptized into the church so that everyone was now a Christian! Jesus Saves---Jesus Heals---Jesus Delivers---Jesus RELEASES!.......x482.......In the Bible this is what Jesus did. This is also how the church in the Bible operated. They understood clearly hat He was alive in them--and would and could operate His ministry through them as a group (this is what apostleship was all about!) But history shows us that all the parts of Jesus' ministry were stolen--claimed to be under the authority of the church organization--under the authority of the earthly leaders of the church. Hundreds of years ago, Jesus was left out of the picture completely. but history tells us a wonderful story--God has been restoring the ministry of Jesus, back into all His church--!! The One Man Who REALLY Understands the Bible.......x459.......Biblically, there is no such thing as "clergy and lay people". This concept comes to us from the church of the dark ages, when only the local priest could read. He was also the only person who was allowed to read the word of God--unfortunately he read it in Latin--a language which most of the people did not understand! Now, of course we do not follow these ideas today--YET--we still operate our Churches with this same idea. We still sit quietly "under the authority of the pastor"--the one person in the church who can teach doctrine and read the word! Psalm 68:18--the establishing verse for ministry--Does anybody know this?.....x280..Our quiz question for every pastor and minister: What is the Old testament verse which establishes the "5-fold ministry" of the new testament? Answer: whether anyone knows it or not--whether anyone likes it or not--it is psalm 68:18. An incredibly little known or studied verse, which states rather clearly that these gifts of ministry are given to humanity--to every one--even the rebellious! Do we know this at all? Has anyone ever studied this at all? Clericalism--Look It Up In Your Dictionary Some Time!.........Have you ever heard of the term "clericalism"? This study takes a page out of a common dictionary, and studies the history of the idea of "clergy" within the church. The church operates through a type of Levitical priesthood---only problem---the Levitical priesthood is abrogated in the new covenant! Controling The Money......X109C.....The traditional system of "church" gives all the control of money to a few people. Is this Biblically correct? Scholars have been working for centuries to hold this idea in place. Look at the Bible yourself and see if this is the correct way for the church to work. Tested and Proved......x322.....Have you ever heard the saying "you must be tested and proved" in order to be a minister? Well, this is true--that statement is made in reference toward ministers (deacons) within the church. However, since we take those words out of context--exactly what is the "proof--and the test" for ministry? Isn't it church attendance--education--and myriad of other requirements? did you know that if we dared to read those words in context, the Bible would qualify probably about 90% of all Christians for ministry? Some Stuff That Catholic Folks Believe......x200805......Okay, you're not catholic, so why should you study catholicism? Well, maybe you are following decisions of people who lived centuries ago and don't know it! What Is "Church"?......X109K....The biggest problem in Christianity is that we go to "church" before we have ever studied the Bible. We "see" something that calls itself church--but is it really correct? Are we using the Bible to define our actions and operations--or are we just blindly following tradition? US founding Fathers--Good Christians........x181......The USA was founded in rebellion to Christian authority. The founding fathers of our country were good Bible reading Christians and understood that Jesus makes us to be free. They set up a constitution which granted separation of church and state--and a system of checks and balances--things which are very Biblically correct. Peter==Pater--papa--pope--priest---pastor......x519........The tradition of the Roman church tells us that Jesus designated Peter to be the first "official" leader of the church. Their tradition then lays all their experience and traditional changes upon these verses (Jesus was naming a "pope"--who is the "official pastor of the official church--who "owns" the priesthood--a priesthood which we carry on with our concept of "pastoral authority") We go a long way in the wrong direction on some simple verses. Jesus was simply prophesying and releasing Peter to lead --but how? What does Jesus and later Peter say shepherding or "pastoring" really is? Guess-what! It's the annointing to release others to serve God---somebody read the Bible!!. Priest--To---Pastor .........x417.......Where do we get our concpet of "pastoral authority" from? It is simply the remnant of the government of the Roman empire still within our churches of today. We challenge all Christian to study the history of the Christian church--with an open mind and heart. Wrong government holds incorrect doctrine in the church..........x96..........Church history (and the beliefs that many still cling to!) shows us that wrong doctrine in leadership corrupts an entire body of believers. The key to this is the common misconception most churches have with regard to church authority and submission. Sabbath purpose..........x513.........The purpose of the sabbath day, according to the Bible, was for sanctification. The sabbath was for "getting your sin cleansed"--a day when most of Israel could not work--except for the Levites--the priests of the temple--who did their work of carrying on the activities of making blood offerings etc. which had the purpose of sanctifying--but only for a time. The rituals of the sabbath had to be repeated over and over again--since the "blood of bulls and goats" can only cleanse the flesh temporarily--But we are new covenant believers--right? We have the blood of Jesus Christ--which is meant to "purge your conscience from dead works to serve the living God". Question to the 21st century Christian church---why the endless repetition of a sabbath ritual? Jesus Gave Opportunity..........x200806.......I don't even have to do this Bible study--you know it! Jesus didn't just teach--teach--teach. He gave real opportunity to His followers, to do all the same "stuff" He did. To really serve God and spread the Gospel. The church in the Bible worked the same way. Where has this idea gone in our churches of today? Real Stuff About the Tithe........x514........Open your Bible with us--and study some of the concepts often taught which supposedly speak of tithing as a necessity for Christians. Let's look at these teachings in context--and take the Bible for what it says--instead of what our dark ages traditions say! MORE CHURCH HISTORY.........This area of our website is meant to encourage every believer to study the history of the church. How have Medieval history--the feudal system--the fall of Rome--the protestant reformation-- affected your church? X04.12........How To Feed Sheep..........Are you a "pastor"? When was the last time you fed sheep? I mean, real, wool-covered sheep! 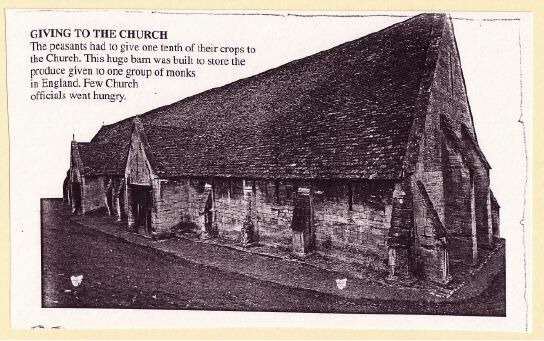 In order to feed sheep, you do not throw seed at them (this is how you feed chickens--and perhaps why our churches are filled with Christian chickens!). In order to feed sheep, you open a gate, and let them freely roam to find their own pasture. This is truly how one feeds sheep--but it is also the the exact way the Jesus said to feed sheep! X04.08..........Fighting Our EXPERIENCE.........Perhaps the biggest battle we may have as Christians is not to be found in the world, or with sin, but rather with our own experience. Experience tells us certain things about ministry and authority and the way the church should "work". Here are some experiences that you might think are right, but are in fact, Biblically wrong. God has bigger and better ideas than tradition and experience give us, If only we can open our hearts and see that God is so much bigger than the "box" of our church experience! Instead of Sundays--.....x526.......It comes as a shock to most Christians to realize that the church in the Bible had no strict, "holy day of obligation" (all must attend) on Sundays. The fact is that they met every day, in small groups--on a constant ongoing basis--and thus were more effective to carry on witnessing--healing--deliverance--feeding the poor--and release out toward the world. Church tradition turns churches inward--(needlessly!) --when the Bible example is to operate most of our ministry outwards toward the world--after all they are the ones who need salvation--right?? Philip asks a doozy.....x518.........In the book of John, the apostle Philip asks Jesus a question--to "show us the Father". Jesus answers with a simple explanation of how the power (authority) of God is going to be distributed in His church--in His kingdom. Is it just to "some" people who then exercise authority over the rest? Nope. The authority of God, comes direct to ALL BELIEVERS--from Christ Himself--and not through others--NOT one over another amongst ourselves. Well, where did we ever get such an idea in the church (ministry=authority)? Study history and you will find out. X0613..........Earmarks of a Cult........The operational plan of the Christian church is that of a cult. Let's look at some points that verify this. 1st Century Jewish perspective..........x108..........The church which is our example from the Bible consisted largely of Jews. This is the perspective which God chose to bring us the New Testament. They understood clearly what the tithe was--what the temple and the offerings consisted of--and they clearly understood what Jesus had freed them from in the New Covenant which they embraced. X0612.......Context.........We do a repetitive format, and call it "church". This format serves to define us, and define the way we read the Bible, because we simply are not reading the Bible from the writer's context. 1 Timothy 3---all about the House.........x109......The Bible has been translated by experience--specifically with regard to the church and it's operation. 1Timothy 3 tells us about simple ministries of service in the homes of Christians, and not our Roman concept of "church"
the 3 Places they met in the NT church--which we replace with Sunday worship..........the church in the Bible met together in 3 places. They fully realized what Jesus meant when He said "Where 2 or 3 are gathered in my name there I am in the midst". Wherever they met, the Christ inside of them operated--and they realized the potential of bringing that to the world. The Devil Changed His Tactics--And we still haven't figured It Out! !......x148.......A history of the early church and it's governmental change during the Roman occupation of the church. History tells us where many of our wrong concepts about the operation of the church came from and we need to stop and ask ourselves why we still follow so many of these ideas today. The True Christian Tithe.....X109A.......The book of Hebrews tells us that Jesus is the high priest of the new covenant. But what tithe does He receive? "He receiveth them, of whom it is witnessed that He liveth"--in other words Jesus' tithe is the souls of those who are saved! Do you want to pay tithe? Then go get someone saved! church is not a building and office is not a room!.......x153........Tradition has handed us certain concepts which are simply not Biblical--yet we still translate the Bible by our experience. When we read about "the church at Ephesus" do we think of a building with stained-glass windows--or do we realize that the church is truly and always people and NOT a place? X0616..........The Invisible Christians.........This is a conversation with another Christian, asking them about their church, and why it is, that a giant, "evangelical" church has not witnessed the Gospel in their own neighborhood. X0624...........Christian Church Building..........The Bible tells us to "build the church". Tradition makes us build a building which operates by many old covenant principles. The church is people and the old covenant principles are wrong. Complete In Him.......x497........The Bible tells us plainly that Christ is the Head of the church--and the head of every man. We as individuals are complete in Him--we will only be fully what he wants--we will only reach our full potential as Christians if we operate completely under His authority. Jesus told us specifically--3 times in the Gospels--that amongst ourselves we are not to exercise authority one over another--specifically not to operate in his manner as the world does. Pharisees--Have made the form of the church we function in today.......x469........Jesus describes the Pharisees--and how they operated. When we study history--we see that in the dark ages--in the times when the Roman empire controlled the church, tradition began which took the church into a form of government which imitated the govenrenment of the Pharisees precisely! For over 1,000 years the "church" was powerfully under this type of Pharisitical government--and the remnants of it are still upon us and upon the ministry of every Christian to this day. worldly system and kingdom of heaven--w/regard to tithe........x449...........In the world, the person who can convince others to give them their money, rules with authority over others. This is the basis of a successful business plan. Money is the "bottom line"---the leader controls all of it, and commands it's uses in the company. Should we really have the same system in the holy church of God? Is this God's highest call for us as Christian brothers and sisters? Yes, But Only Jesus Can make an Apostle.......x448.......Study the word "apostle" in the bible. Look up the word "sent" and you will find that in Greek it is "apostello". You will find that apostles are all over the new testament and central to the operation of Jesus' ministry as well as that of the church described in the Bible. Tradition tells us that the apostolic dispensation has ended--the apostles contained in the bible ought to be revered (perhaps worshiped!) --and looked at as distant examples. Tradition says we ought to build a pastoral church--something which has no real Biblical basis. What if we operated by the apostolic method described in the Bible? NT church by OT Rules....x261............We operate ministry within our churches based largely on old testament ideas. We have a Levitical priesthood within the church. We build temples to God. Just these 2 concepts steal the ministry that the new testament says in supposed to be in all the body--and steals the priesthood that every Christians is supposed to be operating in. The clearly abolished old covenant ideas were placed in the church hundreds of years ago, and have been stealing the ministry and preventing Christ from being the Head of the church--and continue to do so today! X0625..............Can King James Be Wrong?...........To believe in the infallibility of the King James Bible is comparable to the catholic doctrine of the infallibility of the pope. The KJV is a really good Bible translation, but it was done by sinful human beings who made some mistakes. Those mistakes have been handed down to us and they are specifically about ministry, authority and church operation. Promotion ?--within the church? ?.........x279...........In essence, the system described in the Bible is one of immediate and automatic acceptance of a person's abilities and gifts, and immediate use of these gifts. But we are under 2,000 years of tradition. Tradition, which whether we realize it or not, has placed many of the world's sytems and ideas within our ideas of church operation. In the body of Christ described in the bible--there is no top but Christ! It is disobedient to even think that some people are "over" others in the church! The Romans Built buildings in order to rule.......x291........The Roman plan of conquering was to conquer a people--and build a structure which represented their rulership over those they had conquered. they then taxed the people to death (if you couldn't pay a Roman tax collector--you might get killed!) and set up a ruler who "owned" his subjects at the local level within the vast Roman hierarchy. This exact system became the operational plan for the Christian church for hundreds of years--and we still follow it's call to this day! "Preaching"--Why Are We Yelling AT One Another?.......X109H......To preach means to proclaim with power! And many of us go to church and are "preached to". What's wrong with this? Well, the Bible tells us that we are supposed to be preaching the GOSPEL to the world--not yelling at one another! The Sunday Morning Whipping........x318.........the church in the Bible met anywhere the Spirit lead. One way was an assembling of themselves together (which was a long--perhaps days long meeting for all to be refreshed and filled with the Spirit)--this meeting was done only occasionally--as the Spirit lead. The daily meeting places were the homes of any Christian--or literally anywhere 2 or 3 were in agreement--including the temple of the people who were trying to put them in jail--the Jewish priest and elders! history has changed this--turned our meeting together from Spirit lead to law driven--and taken away the apostolic freedom which Jesus gave and translated it into the authority of man--thanks to the Roman empire! X04.07.......Pastors--biblical points to understand..........Some time, get out your Bible and concordance or Bible software, and study "pastors". It won't take you very long--since there is not much mention of them in the Bible. Yet in the church of today, it seems everyone is a "pastor"! Does anyone beside ourselves worry about this fact? the One Way Pulpit.......x320........Do you have a pulpit in your church? Does it look like a Roman column? (hint-hint!!). Tradition, which simply is not to be found in the Bible, says that one person within the church has the right to teach all the doctrine, and without questioning in any way. Why do we spend so much of our operational time together "under" the pulpit? The Format........x329........Go to church on Sunday. File in--sing some songs of praise to God--sit quietly and respectfully while the leader gives the sermon--file out. Does this sound familiar to you? Is this all that God wants us to do when we get together? This "format" comes to us from tradition which originated in the Roman empire. The word of God clearly speaks against this format--and gives us a far better--easier--more joyful--more powerful--more effective way of operating--when we are together. X04.18.......Talk About Baptism.........Does your church believe in baptising babies? Probably not. So? Well, if your church does not baptise babies, then you are saying, that some time in the past, people made wrong decisions about how to run the church. You are saying that is might be possible that people who lived in the dark ages changed the church. But--maybe baptism wasn't all they changed! Study history--study the Bible! How did Paul become a minister?.......x34.......Paul, our most definitive, new testament ministerial example, makes the clear statement that he did not receive his ministry by man--but as a gift from God. In history we find that all the gifts (including the gift of salvation by grace!) were stolen from the church. Rather we should say that the church was redefined by Roman emperors, the common people being made functionless peasants--(not really even considered to be the church)--and under the dominion of the leadership of the church--authority gone mad is the tradition of the Christian church--a tradition which separates us from the simplicity and purity of the word which comes to us through our example Paul. Titles of distinction?..........x350..........Very powerful tradition in the Christian church says that some people among us have titles of ministry which bear authority over others. But the Bible shows us plainly that ministry is a function--an operation--an anointing--NOT a title of rulership. Yes ministry has authority--the authority to teach the Gospel (to rule over sin)--to heal the sick (to rule over all manner of sickness and disease) and to cast out the devil (to rule over the enemy and his strongholds)--but specifically NOT authority one over another amongst ourselves. Who Put In the rules?....x376........It is amazing how we operate our concept of church by out of context teachings which are handed to us by tradition. "God is a God of order." --this is often quoted to enforce the ideas of pastoral authority--of formatted church service--in which only the leadership can pray or operate or be heard within the church. Do you dare to read this verse in it's Biblical context and find out what kind of "order" God really desires and commands within the church?. Dispensationalism That We all Follow.........x409.............The Spirit-filled church prides itself on believing that it does not believe in dispensationalism. the truth is that most churches operate with the concept that the apostolic dispensation ended, and God want us to operate the church by pastoral ministry (something which is unclear and undefined in the Bible!). We don't want the apostolic revival which the New Testament Bible describes--we want what we know--pastoral authority!. Doctrinal Corruption Gone--But Functional Corruption Still With Us! !.....x420...........The reformation of the church 500 year ago began to rid the church of doctrinal corruption (thank God). However, do we understand that the priests of the Roman church simply became the pastors of the reformed Churches--and that church operation remained and still remains almost exactly the same as in the Dark ages?. the Roman emperor Says "build" and we Still Obey!.........x435..............The Bible church was selling what they had, to give to the poor within the church--so that every member could operate effectively in serving the will of God on a daily basis. 1700 years ago, the Roman emperor declared himself the head of the church, and introduced the Roman building plan to the church--conquer by building and ruling over people is the basis of Roman empirical growth--and the same plan of most of our churches today. why not the Bible plan? It's much more cost-effective!. Saint Epaphroditus.........x58...............The early translators of the Bible worshiped the saints. They believed in titles of honor. We still suffer with this mistranslation problem--when we read of the functional titles of the ministry gifts (most especially apostles) as titles of honor and rulership--of "sainthood". this study proves out this truth--when we see Epaphroditus--not given the "title" of apostle. The Real Principalities and Powers........x61...............Church tradition strongly emphasizes rulership and authority over the people. This tradition holds masses of Christians from being all that God created them to be---study history!. To What Do we Submit?...........x86..............It has taken the church hundreds of years to understand the 2-way street in marriage. The church traditionally stressed the submission of a wife to a husband--and left out the command of love that the husband has. We understand the importance of context in the marriage submission--and the balance described--yet not so in terms of submission to "the rule" in the church. Where Is Your Church Stuck?...........x92.............The history of the Christian church relates the move of God to us thought the centuries. Our modern denominations in many ways reflect the places where Christianity has been "stuck". the fullness of God is the glorious church--all serving God's will freely on a common level. Pastor--Priest--Roman system--all based on the Old Covenant......x509..........Hundreds of years ago, Roman emperors created the system and format for the Christian church--based upon the notion that they had "declared" everyone a Christian--and now were simply interested in teaching and controlling the people who were "under their authority". They used out-of-context verses from the old covenant to do this---here's how. Apostleship---what it really means.....x 510.........Most Christians probably have no idea what "apostleship" is. The Bible tells us that we all have been given "grace and apostleship" (Romans 1). We understand the grace--do we know about the apostleship we have who have been born-again have received?. The Church a "type of Israel"?........x511..........Have you ever heard this idea taught? Did you know it is wrong? It can easily be misinterpreted to mean that we ought to study Israel as our best example of how to operate the church--we would be very wrong! In fact, the Bible tells us exactly the opposite--Israel is the "shadow" of the church--it is the church of the Bible (and hopefully us today--if we will strive toward their glory!) which is the correct example--Israel was simply a prelude--a prophetic statement of what Christ would accomplish through His church. Israel is the shadow--not us!!. Christians: On Full--or empty..........x530............Have you ever read the Bible and realized--or at least had the inkling that they were doing things differently than we do? We have firm traditions about how "church" should look and work. Our system ignores that fact that release ("setting at liberty"--literally "apostolic freedom"--the freedom to operate in ministry) was intrinsic to Jesus' ministry--an important part and result of the Gospel itself. This study looks at some of the places where the church "needs some work"-! Around the world--Again and Again!.....x531..........The airwaves are filled with "big-time" ministries--many of whom advertise that if you send them some money--they will finally fulfill the prophecy that the Gospel will be preached to all nations. Well, for almost 100 years the Gospel has been preached around the world by shortwave radio--so where's Jesus? Television signals have reached all the planets in our solar system--yet the Lord hasn't returned yet--right? Maybe we need to look carefully at the Gospel that Jesus proclaimed. Maybe it's the Gospel that we haven't fulfilled--maybe all the tools we need are there--we just need to get the true full Gospel message right--the message that includes release-! Apostles--someone who is sent--not a title to bear........x117......Apostolic ministry was Jesus' first concern and the same can be said of the early church. Just what is an apostle? Do we have a clear Biblical understanding of this most important Bible ministry? church attendance--the prerequisite to ministry.........x152.......In order to be in "official" ministry within any church--one must submit to the authority within that church, and regular church attendance certainly is a pre-requisite. But, is this Biblical? freely ye have received, freely give.........x183.........Sowing and reaping is the process of ministry. The Bible tells us that we have received Christ freely--and we are to give freely also. The Christ, the gift of Christ we have each received, is meant to be given freely--this is what ministry is: Christ inside of each of us reaching out to others.